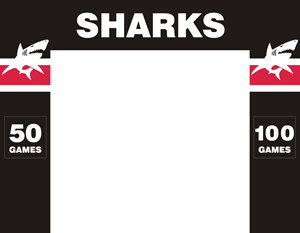 The Club has purchased 3 of these banners for use by Sharks families to celebrate the milestone games. The inside section of the banner is designed to be filled with crepe paper and used as a run through for the players. The inside dimensions for the gap area to be covered in crepe paper is 2.4m wide by 2.2m high. Please allow 2.5m x 2.3m to allow for overlap of the paper. There are “50 games” and “100 games” signs supplied that are attached with velcro to the banner. The banners will be available on the Wednesday prior to the milestone Sunday game. If you are the first family for the day to use the banner, please contact us to obtain approval to collect the banner prior to the Sunday. For families using the banners later in the day, please allow 30-40 minutes to attached the insert to the back of the banner. After the game, the banner must be cleaned and returned. These banners are for use by all Sharks families. Please be considerate of other families who may be using the same banner on the same day. The banners may be collected by the first family to use the banner on each Sunday if arranged in advance. The Away Banner must be returned to the person who you received it from. The banners must be cleaned of all crepe paper and tape so it is ready for use by the next family. Phelan Like a Banner is a local banner making business that makes custom banners for football games. There is no better feeling than running through a banner, and no worse a feeling than sitting around all week sticking one together, so we will do that bit for you for as little at $100 a banner. 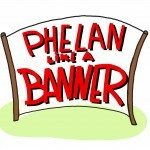 Phelan Like a Banner will design and manufacture the insert, which will need to be taped to the surrounding banner. Banner inserts must be ordered at least two weeks before the game and can either be picked up from Luke Phelan, or arrangements can be made to meet at Domeney for you to receive your banner. To purchase a pre-made banner or for any other enquiries, please contact former Sharks Colts player Luke Phelan. Crepe paper to cover the insert. Insert dimensions are 2.4M wide by 2.2M high. Please allow 2.5M x 2.3M to allow for overlap of the paper. Rubbish bag to collect all the pieces of paper from the ground prior to the start of the game. Narrow and wide adhesive tape. It may take 30-40 minutes to attach your insert to the banner – please allow plenty of time. 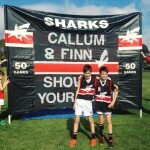 Attach your insert to the BACK of the Sharks banner – numerous run-throughs by strong young footballers can remove the paint from the edges of the banner! Attach using lots of small sections of sticky tape, do not use long lengths of tape. Parents have forwarded these handy tips, please contact us if you have anything to add. Shop around. It may take a few visits to obtain enough red, black and white crepe paper. It has been suggested that Lombards has long rolls of crepe – perhaps you could combine with another family to use a roll of paper. In Eastland Shopping Centre, the newsagent near Woolworths has “Gala” crepe paper – packs are 2.4M long x .50M wide. 7-8 packs are required to make an insert. Remember the banner opening is 2.4m, so extra paper would need to be added so there is an overlap where it is to be attached to the rear of the banner. Available to download and print so that the Sharks logo can be enlarged on a photocopier and then attached to your insert. Use small sections of adhesive. Tape on the back of your insert. Tape insert to the BACK of the banner to avoid paint being removed as the kids burst through the banner. Tape across the banner using short lengths of tape – better for the kids when they burst through and also easier to remove if you make a mistake and have to peel off the tape! Wide (approx 5cm), clear packaging tape was used to attach the insert to the back of the banner . Reports of 3+ hours to construct the insert and 30-40 minutes to attach the insert to the banner. If transporting the insert already attached to the banner perhaps wrap in a travel rug/tarp to protect the crepe paper from tearing. The poles attach in the middle of the banner but do easily come apart so perhaps some tape around the joint would help this. Try to get helpers to hold the banner and/or support ropes so parents can video/take photos of the burst through. It’s great to have photos taken from the front and back of the banner to capture the whole event. Then after hours of work and preparation, it’s over in seconds, and the rush to clear up the paper before the siren begins!